Sugar does more than just rot your teeth. 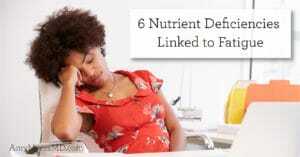 It wreaks havoc on your gut, your skin, your joints, your mood, and sets you on the path to chronic illness. There’s no doubt that sugar is bad news, yet Americans still consume an average of 20 teaspoons of sugar daily. 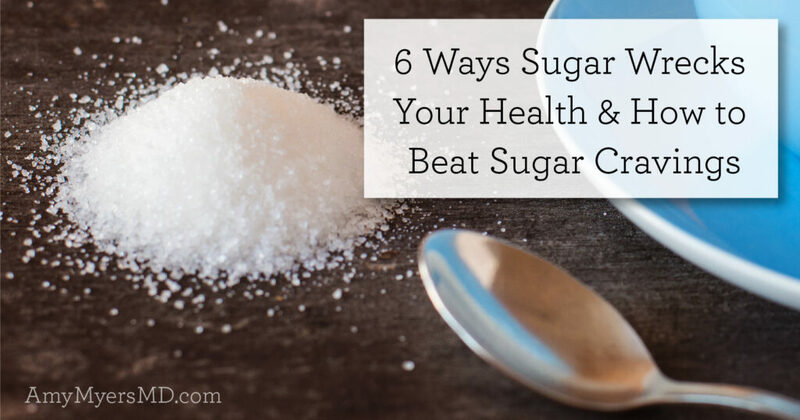 That’s an astounding 66 pounds of added sugar per person annually.1 If you’re looking to optimize your diet, read on to find out the many ways sugar wrecks your health along with some helpful strategies to beat sugar cravings and kick the habit for good. Let’s face it, sugar is one of life’s sweet treats, a “guilty pleasure” that is difficult to avoid over the course of your day if you’re not actively checking ingredient labels. Aside from the usual suspects such as baked goods, soda, and fruit juice, sugar can be hiding in everything from pasta sauce to yogurt to salad dressing. The good news is that the FDA now requires most companies to list added sugars on packaged goods, so you’ll know how much sugar is naturally occurring in the foods used to make the products, and how much is just empty calories. So how much is too much? The American Heart Association recommends that women consume less than 25g, and men less than 36g of added sugar per day.2 To put that in perspective, there are roughly 4g of sugar in a teaspoon, so that would be less than 6 teaspoons a day for women and no more than 9 teaspoons a day for men. Remember that this is the upper limit, and I recommend aiming for even less than this amount to achieve optimal health. In our hunter-gatherer days, a piece of fruit would be a welcome source of quick-release energy. Refined sugar, however, is a modern invention that our bodies did not evolve to have the capacity to deal with properly. We are also consuming far greater quantities of sugar than we were ever designed to handle. In the course of a normal day, your body simply doesn’t need all those quick, intense bursts of energy that sugar provides, especially since you aren’t running from predators or hunting down your own food. Not only is added sugar unnecessary for proper functioning, it’s actively detrimental to your overall wellbeing. 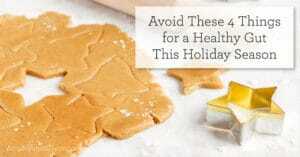 Let’s take a look at some of the many ways sugar wreaks havoc on your health. Sugar affects your entire body because it is an inflammatory food, and inflammation is at the root of nearly every chronic illness. Studies have shown that a high-sugar diet is linked to joint pain and increases your risk of developing rheumatoid arthritis.3 That’s because excess sugar in your bloodstream generates free radicals, which damage your cells and trigger an inflammatory immune response.4 The more inflammation you have, the further up you are on the autoimmune spectrum, and the closer you are to developing a full-blown autoimmune disease (or a second, or a third). What you eat has the power to alter your gut microbiome, and research shows this can happen as quickly as 18-20 hours.8 This is important because a diet high in sugar feeds the yeast in your gut, which can lead to Candida overgrowth. Candida overgrowth causes a wide range of health issues, including vaginal infections, seasonal allergies, digestive issues, and skin or nail fungus. Candida also causes leaky gut and can trigger or worsen autoimmune diseases by suppressing the immune system and prolonging inflammation.9 And because yeast feeds on carbohydrates, once you have an overgrowth, the Candida will cause you to crave sugar even more, leading to a vicious cycle that’s hard to break. Skin health is more than just vanity. Clear, glowing skin is an indication that everything underneath is functioning optimally. Sugar messes with your skin in a few critical ways. According to the American Academy of Dermatology, foods with a high glycemic index such as sugar or carbohydrate-rich foods can cause breakouts.10 Sugar also binds to proteins in your bloodstream and forms molecules known appropriately as AGEs (advanced glycation end products).11 AGEs damage your skin’s elastin and collagen (the protein that keeps your skin firm and plump), leading to wrinkles and saggy skin. Sugar not only affects your physical health–it has a huge impact on your psychological health as well. That’s because sugar is essentially a drug in the way it interacts with your brain’s reward pathway. When you eat sugar, your dopamine levels surge in the same way they do with heroin (though not quite as intense).12 Eventually your brain gets addicted and requires more and more sugar to get the same amount of pleasure, which is why eating sugar makes you crave even more sugary foods. Now that you’re convinced that cutting back on sugar is one of the best ways to attain optimal health, you’ll need to arm yourself with strategies for overcoming those dreaded sugar cravings. Fortunately, once you’re no longer relying on sugar for a quick fix, you will begin to crave sugary foods less and less! Here are a few tried-and-true measures you can take to curb those cravings. You’re probably all too familiar with the phenomenon of stress-eating. After a disagreement with your spouse, a hard day at the office, or any other emotionally troubling event, you find yourself reaching for the pint of ice cream, the candy bar, or another sweet treat that will trigger the release of feel-good chemicals in your brain. Don’t beat yourself up–it happens to the best of us! And it has nothing to do with willpower. In fact, stress-eating is hard-wired into our systems! When you’re stressed, your cortisol levels shoot up. Cortisol is your body’s “fight-or-flight” hormone that helps mobilize sugars to your muscles in order to give them the energy to fight or run away from the stressor (e.g. a lion).17 However, this evolutionary response does not align with our modern day stressors, which are chronic and largely psychological. If you are stressed out all the time as many of us are, your body thinks it needs a constant supply of sugar to fuel your muscles to overcome the obstacle at hand, causing you to “stress eat” loads of sugary foods. The solution to this is to manage your stress with self-care. Find ways to reduce your stress levels, whether it be through meditation, a walk in nature, a fun hobby you enjoy, or pampering yourself with a massage. When you feel a sugar craving coming on, try a stress-busting activity instead, even if it’s just sipping on a warm cup of tea! Another strategy for beating sugar cravings before they arise is to nourish yourself with filling protein and healthy fats. If you’ve ever experienced the irritability that comes with low blood sugar from not eating (known popularly as being “hangry”), then you know why it’s tempting to reach for sugary food that will get digested rapidly to bring your blood sugar back up as fast as possible. However, this inevitably sends your body on a rollercoaster of insulin spikes and crashes, leading to even more cravings. There are a number of supplements you can take to support your efforts to tame sugar cravings. The first I would recommend is L-glutamine. L-glutamine keeps your blood sugar levels stable throughout the day and supports a balanced insulin response. By curbing sugar cravings, it helps you maintain a healthy weight. My Leaky Gut Revive™ powder contains 3000mg of L-glutamine, plus deglycyrrhizinated licorice, which is also beneficial for maintaining optimal blood glucose levels. B-vitamins such as thiamin and niacin are great for beating sugar cravings because they help your body deal with stress and metabolize nutrients (which are often depleted by stress) more efficiently. Finally, chromium is a trace mineral that prevents cravings for carbohydrates, supports optimal fasting and post-meal blood sugar levels, and assists in mitigating adrenal cortisol production. Chromium also helps you maintain normal insulin sensitivity. Get on the right track, support a balanced insulin response, and help keep your blood sugar levels in check throughout the day. By making the right lifestyle changes and incorporating these supplements, you can take back your health and live your best life.